Ten wpis został opublikowany w kategorii mingw-64, python3 i oznaczony tagami cython, ipython notebook. Dodaj zakładkę do bezpośredniego odnośnika. ← Python vs Cython vs PyPy. MSYS2 has mingw-w64-cython already so you do not need to compile it. Yeah, I suppose you translated it in google translator and it did it wrong ;). 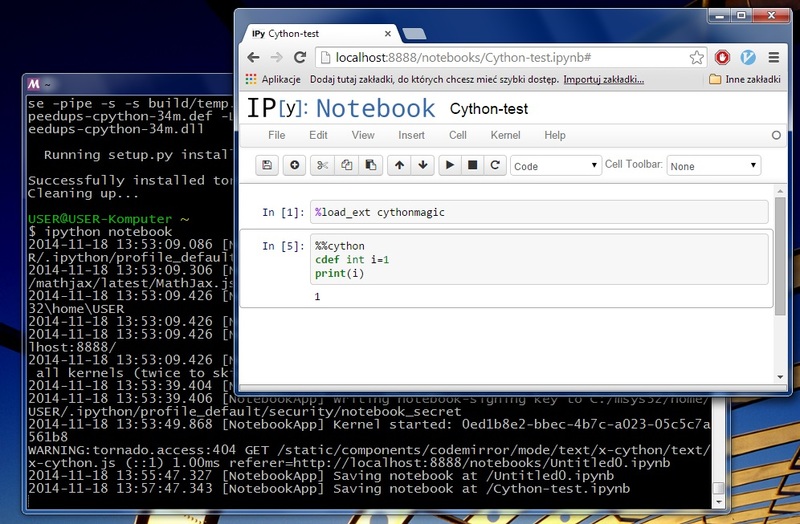 What I meant was that after installing Cython on CPython (official Python release from python.org) on Windows I couldn’t configure python-notebook in a way allowing to use mingw-w64-gcc as a compiler for %cython_magic. That’s why I decided to try msys and then stumbled upon msys2. It works beautifully in Python installed on msys2. Zeromq, jinja2 and sqlite are in msys2 repository, pyzmq, tornado and pysegments have to be installed using pip. Yes, it was a Google translate failure I fear! Now if only chromium could be compiled with mingw-w64 then we’d have everything needed for this.